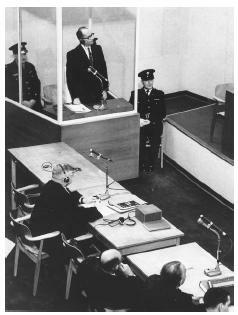 German Gestapo officer Adolf Eichmann listens to the guilty verdict read by the presiding judge as he stands in a bullet-proof glass enclosure in a Jerusalem court in 1961, during his trial for committing wartime atrocities against Jewish Europeans. The Nizkor Project. < http://www.nizkor.com > (November 10, 2002).